According to a survey conducted by the Workplace Bullying Institute, 35% of Americans reported being bullied at worked. Workplace bullying was found to be 4X more common than sexual harassment and racial discrimination. “I know and have worked for executives who relish few things as much as the fear they see in a subordinate’s eyes. Some even have rituals designed to keep those who report to them in a constant state of fear and uncertainty. They purposely interrupt staffers when they are speaking. They keep them waiting to establish superiority. They sift through an otherwise strong report or presentation and play up its weaknesses. They needle, needle, needle. I have two thoughts about this management approach. First, life is too short to act like this. Corporate Bullies who work to establish a corporate culture of fear are not operating from a source of strength (see blog How Fear Interferes in the Workplace); it is a sign of their own fear(s). It is unresolved baggage, unfinished business, that is manifesting itself as a show of power, when it is usually a case of feeling like a loser, or feeling powerless in some other respect, such as rejection, emotional discomfort, or constantly being wrong. A healthy workplace includes validation. (For humor and to illustrate the point, see this short film entitled “Validation”: http://www.youtube.com/watch?v=Cbk980jV7Ao). Validate someone for who they are and what they have done, then ask him/her for more. Get their input and incorporate it into your vision, if possible, to sharpen it. When your direct reports see that you listen and utilize their ideas, they feel validated. Listen & Enlist. This was the successful technique of Roman rulers who would ask their advisors as to what the people said, as well as Paul Bocuse of the gastronomic center of the planet, Lyon, France, who became successful from incorporating his customers’ comments into his culinary creations. All Breadcrumbs Lead Back to the CEO. The problem will continue to persist, if the CEO chooses to cast a blind eye on the situation. S/He needs to do her/his job and demand that all recruited employees are treated as prized resources and humanely. Create a Policy of No Bullying. Unlike legal protection against sexual harassment or racial discrimination, there are no anti-bullying laws. This issue and policy-making relies on corporations. Reward Supervisors on Trickle-Up Results. A system of anonymous 360-review results provided on Senior Management should indicate whether the supervisor is practicing healthy workplace behaviors. Take a Stand. Fewer than 1% of co-workers surveyed have taken a stand when they see their colleagues tormented. They fear losing their own jobs. This is called collusion or tacit consent. How can we “Be the change we wish to see in the world” and concurrently question, “Why do the worst employees rise to the top as Senior Management?” Our silence grants permission for dysfunctional behavior. Retain Leadership Development & Organization Development Practitioners. Coaching is required at all levels, beginning with the top. 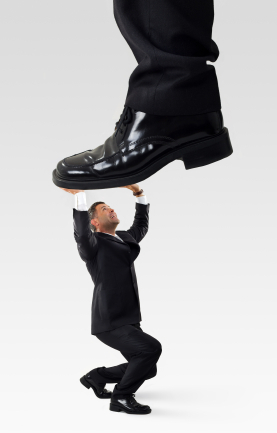 Pride before a fall…if Senior Management believes it is too good to receive input, then the organization is in serious trouble. Advice: Jump ship, Mateys. Meg Whitman, The Power of Many, (New York, NY: Crown Publishers, 2010). Posted on May 26, 2013, in Uncategorized and tagged Bully, Coporate Bully, eBay, Employee Relations, Hewlett-Packard, Lyon, Meg Whitman, New York City, Paul Bocuse, Workplace Bullying Institute, workplace harassment. Bookmark the permalink. 1 Comment.